Bicycles are always popular due to the simplicity of their use, the effectiveness of the training and opportunities to improve their physical shape without leaving home. This time we present a Sunny Spin Bike Review. Excellent striking design and a reliable manufacturer is not the only advantage of it. Want to know more? We plan to talk about the possibilities and advantages of this equipment. Keep reading and share your opinion. This model is made of durable steel pipe. The width of the legs makes the exercise bike stable. Special anti-slip feet are provided. You can adjust the height and distance of the seat, as well as the height of the placement of the steering wheel. On the pedals there are special mounts for reliable setting of feet. The shape of the steering wheel and seat are convenient to use. The manufacturer has been working on the market of fitness equipment for more than 15 years. During this time, it has established itself as a technological company that produces high-quality products. This confirms the high demand for its equipment and numerous positive reviews. You can get acquainted with the full range and learn more about the company on their website sunnyhealthfitness.com. Sunny Spin Bike comes with a 3-year warranty. This equipment is a rather complex mechanism. Therefore, to simplify the Assembly of parts are already assembled nodes. It will be necessary to perform only simple steps to install the steering wheel, seat, connect the nodes together. It is easier to perform expanding all close to and collect the equipment lying. Continue to stand upright and set the options for yourself. More clearly shown in the diagram below. This model is very popular in many shops and trading floors. In most cases, buyers put the maximum positive feedback. How to explain such popularity? The visible and modern design draws attention to itself. It is bright and interesting, many users like this color combination and it makes the first impression. It will easily fit into any interior. Suitable for both girls and boys. The heavy flywheel allows adjusting loading more smoothly and to train qualitatively. You can adjust the load according to the preset options. This will allow you to use the exercise bike as novice athletes and more experienced. Many users noted the good quality and quietness. In terms of functionality, it is not inferior to even more expensive analogs. The unusual shape of the steering wheel will allow you to choose a comfortable position of your hands. It is comfortable to perform exercises. Handle non-slip grip and can be adjusted in position, which is convenient since it is possible to adjust the position of the steering wheel to your height. There are at least 4 basic hand positions. This makes the training as comfortable and effective as possible. The seat is moderately soft with a quality coating. You can also adjust its height and zoom in/out from the steering wheel. After the workout, you can easily move the Bike to another storage location. For convenience, the front leg is equipped with durable transport wheels. An important advantage of this equipment is its ease of use. No need to master the technique of performance or get any skills. We recommend warming up or start training with a small load. This will warm up the muscles, tendons. In addition, too large loads will be your Central nervous system. Then you can make several intervals. In addition to training the leg muscles, you get a high-quality training of the cardiovascular system. For more effective fat burning, we recommend using a heart rate monitor. When working in certain areas of the pulse, you will spend calories most effectively. Talk to your doctor before you start training. Do not immediately start with long training, Increase the load gradually. To maintain an optimal level of intensity, monitor your pulse zones during exercise and rest. 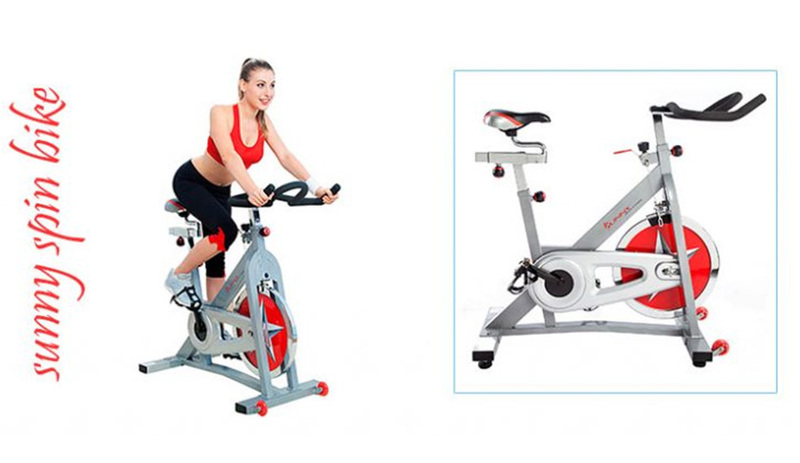 Sunny Spin Bike is a great fitness equipment for home. The high level of quality is combined with excellent design and comfort of use. In terms of functionality, this model provides all the necessary training opportunities. You get a good exercise bike for a reasonable price. In addition, you get 3 years warranty from the manufacturer. Sunny Spin Bike is quite good for the money. I use it at home for cardio. Convenient, easy to use.